Isopods are animals that belong to an order of peracarid crustaceans. This order is called Isopoda. The name Isopoda derives from the Greek roots (iso-, meaning "same") and (podos, meaning "foot"). 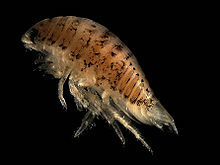 Some isopod species live in water, like the tongue louse. Others live on land, like woodlice and pill bugs. Isopods can be half an inch long. They are usually gray, brown or black, with an oval-shaped body. They have seven armor plates, called "pereonites," which protect them. They also have seven pairs of short legs. Isopods have two pairs of antennae; one pair feels along the ground. Isopods have gills and need water to breathe. Because of this, the isopod species which live on land must stay in moist places. This page was last changed on 25 January 2018, at 16:32.